If I had my way, as a self-proclaimed foodie, I’d settle down to a huge breakfast every single morning! And although we all know that breakfast is super important, I find that whether individually as growing teenagers, hustling adults, parents with kids or more collectively as a family - many times we’re trying to find that balance between being on the go, but still ensuring that we eat healthy nourishing breakfasts. As a child, I don’t have very many memories of weekday breakfasts – but I recall buying fresh bread right off the bakery a few streets from our house that was interestingly called “Fresh Loaves”, buying piping hot meat pies wrapped in brown paper from the baker literally next door to us, and on too many occasions my elder brother literally stuffing his belly with Golden Morn, which he liked thick and with lots of milk! Did you really live in Nigeria or even have Nigerian roots if Golden Morn wasn’t part of your family’s breakfast experience? In boarding school, it was such a prized commodity as well. Friends would easily offer you beverage or sugar, but items like Milk, Golden morn or some other cereal was such a no-go area, especially when as seniors we wouldn’t want to go into the dining hall for school breakfast but preferred to leisurely eat our own cereal either with a heap of milk or a little milk depending on what time of the school term it was - such fun memories! My breakfast habits didn’t change much in Uni and as an adult. Because I very much like to sleep in - but hardly joke with my food yet don’t want to gain weight (I know, the struggle! ), I’m always on the hunt for quick relatively healthy breakfasts. Any many of us are probably the same. As a new mum with a 9-5, I’m currently curious about how other families handle breakfast. I’m keen to hear tips, and of course, what their go to options are. I’d like to create a system where as a family we can all have breakfast before heading out. 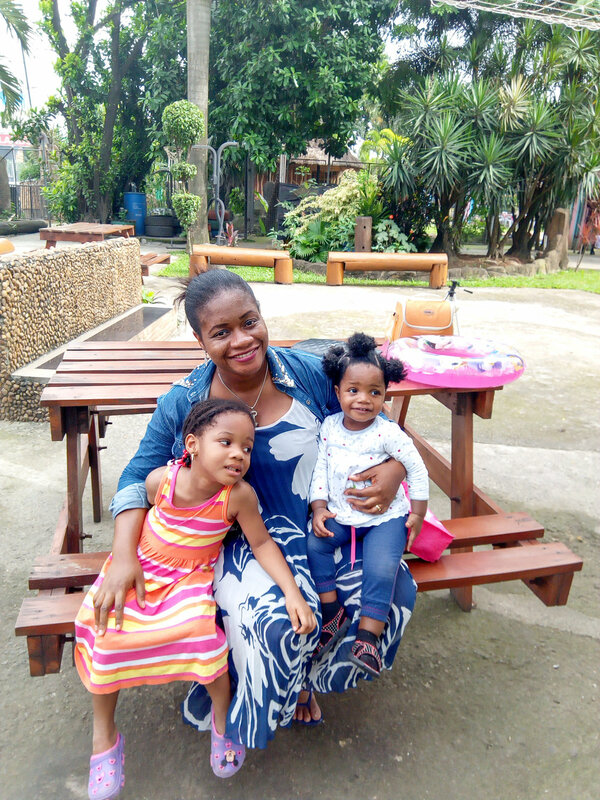 In collaboration with the new Nestle Golden Morn Puffs – we ask 4 mummy bloggers about their breakfast routine, struggles and tips. Read what they say - especially as they share on the million dollar question - milk before cereal or cereal before milk? Breakfast time is important to me mostly because I get hangry on an empty stomach. I'm not one for an early breakfast though. For my kids, breakfast is definitely compulsory and makes a difference. Stocking up on the essential breakfast grocery items, helps to make breakfast time easier. It's important that I prepare what my girls like for breakfast, especially on a school day. We are often rushing to meet up in the mornings and it's usually not the best time to introduce a new thing on the menu. Sometimes, I ask my toddler, Zara, what she would like or she tells me what she prefers. Most times, I prepare the meal and serve. My baby, Kamara starts her day with breast milk, some cereal and anything else we are having. She typically eats from her sister's plate or mine. I'm #TeamEasyBreakfast on weekdays. Cereal does the job many times as my mornings are filled with chores. Other go-to options are bread, oats, eggs, sausage, tea, yoghurt, fruits and akara - on some Saturdays. Mostly because we use powdered milk at home, it’s milk before cereal for us! Even when I have fresh milk, it still goes first. I guess it's because my cubes of sugar has to dissolve properly and I like my cereal a little bit soggy! Kids learn from example. So if you want to encourage them to eat better, prepare healthier breakfast options, eat it and serve it to them. Like adding fruits to cereal, yoghurt, etc. Also, you may consider eating breakfast together and even sharing a plate. My kids like to have some of what's on my plate and we call it "beggy-beggy". I'm sure it's not only my kids that do that - it works! If I had a chef especially during the school term, my life would be easier. Mainly because most days, I'm preparing breakfast and Zara's school lunch at breakfast time. Also, Zara does not like eating breakfast early, so I have to cajole her to eat breakfast on a school day and eat fast too. I prefer easy ready meals for breakfast because I like to just keep it moving and get on with my day. I do not plan breakfast at all but I always make sure I have cereal, bread or oats because those are quick when you don't want to do too much. It’s definitely cereal before milk because that's how I'm able to tell the quantity of milk I want based on how much cereal I take. And if it's liquid milk the cereal definitely has to go in first so that I get the mix right - not too watery and not too thick- just right the way I want it. On days I'm feeling fancy I can do plantain, eggs and sausages or yam/potatoes with a veggie omelette or even akara and pap/custard. I do not have an exact time fixed for breakfast because if I did, I’d be so stressed when I'm not able to meet up. I serve breakfast when I have the strength to get up and get to the kitchen and I do not believe it's the most important meal of the day. To make kids look forward to breakfast, I'd recommend eating with them and definitely having small conversations with them over food. What would make breakfast time as a mum easier for me? Someone else making it! I honestly can’t say breakfast is very important in my household because on a typical weekday morning, the nanny prepares breakfast for the children while their dad and I get ready to leave for work. Then at the weekends we don’t always sit down to have breakfast because it’s too early for the grownups. The big girl has a range of cereals she can choose from while the baby either has oats or baby muesli with some fruits. Saturday is the same usually, but on Sunday I try to make us a special brekkie like a full English breakfast or a typical Nigerian breakfast (agege bread with fried eggs). My 5 year old is convinced one can only have cereals for breakfast so she refuses to sit with us for Sunday breakfast unless she’s had her “morning cereal”. I always do milk before cereal because we warm up the milk in the microwave. When I’m at work though, I pour the milk straight from the fridge. To ensure kids eat better breakfast we need to understand that many cereals sold to children have super high sugar contents. So always read the labels on the back especially the nutritional values: compare the grams of sugar per serving with the recommended sugar intake for the age of your child. You also have to eat the same things you are trying to offer them because kids learn a lot from us. Finally incorporate fruits in their breakfast one at a time especially with fibre cereals. Having breakfast with my girls is one of the things (amongst a million others) I miss about maternity leave. My commute into work is an hour 15mins, so no chance of doing this. parenting and lifestyle blogger writing about everything from culture to parenting issues. Mum to two gorgeous girls aged 10 and 1. I always nag my older daughter about breakfast. Like me, she's never particularly hungry first thing in the morning. Neither of us are morning people, so having to decide on something to eat, or the very act of eating seems to be an unwanted distraction. But, I think it’s the most important meal of the day so I enforce breakfasts in the house! I work full time and this is is the meal that anchors us all around the table and gives us time to bond before breaking off for our respective busy days. Meal planning is great - it saves money and takes away uncertainty in the mornings. I’d love to say that I plan breakfasts for the week ahead, but I only semi-consciously plan them. I make sure there are cereals in the house for the week ahead, bread and eggs for cooked breakfasts etc - but never know what I’m going to make until that actual morning. Cereal is certainly a go-to for my first daughter. We always pour the cereal first, I don’t even get why someone would do it the other way! If I’ve woken up early enough, I might throw on the radio and whip up some American style fluffy pancakes with bacon and scrambled eggs. The baby will eat this, but usually she has porridge oats and fruits. Although I’m half Nigerian, I didn’t really grow up eating Nigerian breakfasts. My dad would make yam and eggs but I hated yam as a child and his version of eggs were not to my liking. As an adult, I really appreciate all things Nigerian, particularly food! The kids love their stew, moin moin, puff puff etc, but they’ve not had the chance to experience breakfasts yet. My tips for getting kids to eat a better breakfast is simple. Make sure there are only good options in the house and plan enough time in the mornings to eat together, children emulate their elders. If they see you eating well, they will too. If they see you gulping down a coffee and running out of the door - what message are you sending them? I found these responses so insightful! The consensus is as I expected - that it can be hard to make time for breakfasts and so quick healthy breakfast are the way to go – especially on weekdays. Healthy cereals are encouraged particularly when mixed with fruits. 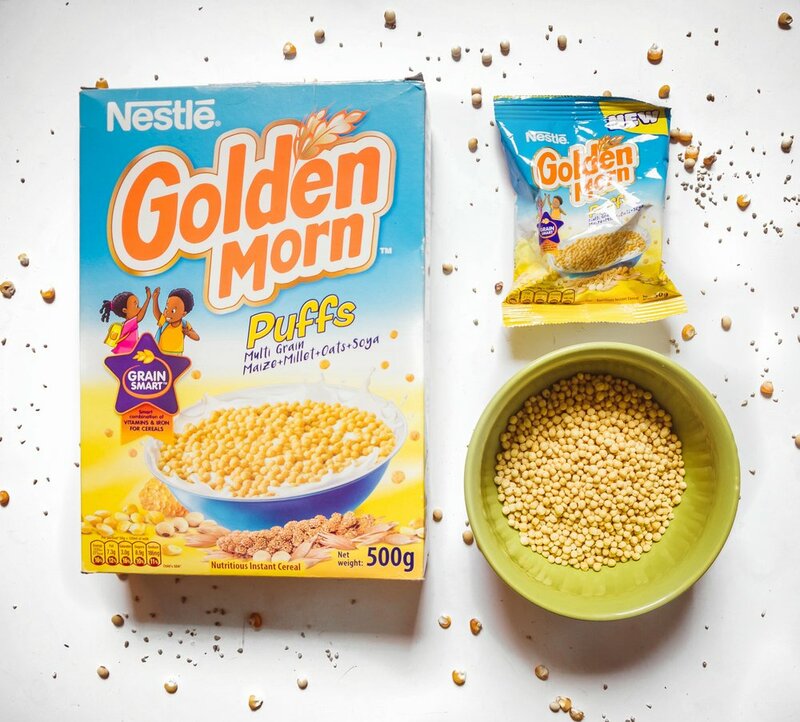 Golden Morn has been such a family favourite to many Nigerians for over 30 years, and this new Golden Morn Puffs is already another favourite for many families. It’s filled with oats, maize, soya and millet – nourishing grains which means you get a super quick, but healthy breakfast - and you can spice it up with fruits, yoghurt etc. One less thing to worry about as a busy individual or parent. Have you tried the new Golden Morn Puffs. If you haven't which would you buy - family pack or personal pack? And it's a tie on this question from these mamas but how do you make your cereal - milk first or the other way round?